In Shakuju therapy, the cause of any symptoms is considered "the deficiency of Jin-qi". So, treatment is tonifying the deficient Jin-qi, precisely speaking, the pathological deficient Jin-qi. The Jin-qi in Shakuju therapy is the "vital energy" in other words. Any human being gets old and dies in the end inevitably. Nobody can live infinitely, and treatment to prolong life is impossible. If possible, rejuvenation also becomes possible. The vital energy is consumed inevitably as one gets older. However, the problem is that one consumes the vital energy more than necessary amount by his/her lifestyle or intemperance. This consumed amount exceeding the original amount is considered as the cause of diseases. This pathetically deficient Jin-qi is what acupuncture treatment is aiming at tonifying. The living person is soft and warm, or rather hot, the clump of heat. On the other hand, the dead person gets hard and cold. When one becomes sick and gets worse and worse, the person dies. Here, we call the condition of sickness as "cold". 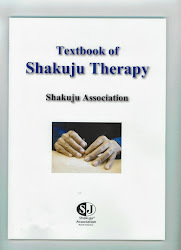 Shakuju therapy has seminars mainly in Tokyo, but we have seminars in Osaka and Hokkaido in Japan as well. For overseas practitioners, we usually have the annual seminar in summer, however, we are going to have Shakuju Therapy Seminar in Hawaii in March. Hoping many acupuncturists all over the world know Shakuju Therapy. If you are interested in Shakuju Therapy, this is the chance!